Calibration Weights are used to check the reading of scale, to make sure it is still accurate. They used when calibrating a scale. While the calibration states how a scale behaves, adjustment of the scale changes its behavior. What it dose is a set of operations carried out on a scale so that it provides prescribed indications corresponding to given values of a quantity to be measured. Therefore, adjusting a scale means modifying its indications in a way that allows them to correspond – as much as possible – to the quantity values of the measurement standards applied. If you need to do a scale calibration you came to the right place. First you need to check your scale manual and check what calibration masses you need. You may need individual weights or calibration weight sets. Remember that many analytical balances and lab balances need precision weights to meet precision calibration weights - calibration standards. If you need help on finding what type of test weights you need please call us at 800-832-0055. We carry the full line of Rice Lake Calibration Weights Class 0, Class 1, Class 2, Class 3, Class 4, Class 6, Class 7, Class F and many more. The Rice Lake Calibration Weights come in all difrent shapes like Grip-handle Weights, Cylindrical Weights, Screw-knob Weights, Leaf Weights, Specialty Weights, Slotted Weights, More Info Hook Weights and more. Class 0 - Ultra Class - Class 1 - Class 2 - Class 3 - Class 4 - Class 7 - More Info Class F and many more. Ohaus Weights are Manufactured to international standards (ASTM and OIML), Ohaus loose calibrations weights and calibration mass sets are available in a variety of styles for a wide range of uses. In addition to the conventional shapes, Ohaus also offers hooked and slotted masses for use in physics. Calibration weights for the continuous accuracy of your electronic balances are available from 1 mg to 50 kg. Class 1 - Class F1 - Class E2 - Class 4 - Class 6 - More Info Class F and many more. 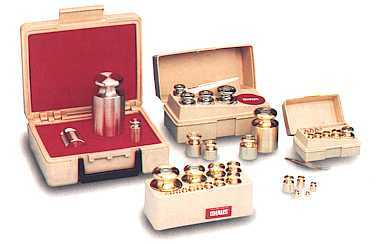 Sartorius Weights are sold individually or as a 9-piece or 21-piece set with a Report of Traceabililty, and, for an additional nominal fee, with a certificate of Calibration. Class 0 - Class 1 - Class 2 - Class E1 - Class E2 - More Info Class F1 and many more. Adam Equipment offers a healthy range of Weights class 0, class 1, class 2, class 3 and class 4. So you can Calibrate your Adam Equipment Scale. Class 0 - Class 1 - Class 2 - Class 3 - More Info Class 4 and many more. NIST stands for National Institute of Standards and Technology, and is a division of the United States Department of Commerce. The NIST makes regulations that manufacturers must follow to ensure industry standards. When purchasing NIST weights or weight sets you are being assured that your weights have been tested to meet their standards. NIST weights are most commonly used for commercial and legal for trade scales. NIST also runs the National Voluntary Laboratory Accreditation Program (NVLAP). This program evaluates and accredits laboratories in their respective fields and ensures they meet ISO standards. ASTM stands for American Society of Testing and Materials. The ASTM is an international organization that establishes and develops methods for testing materials. ASTM weights and weight sets are made to the tolerance, construction, finish, and magnetism set by them. ASTM requires that weights be made of one piece (no fillers or air to compensate for small adjustments). ASTM weights are recommended for calibrating other weights or high resolution balances. OIML stands for Organization Internationale de Metrologie or better known as The International Organization of Legal Metrology. OIML is an international organization that sets guidelines for legal metrology. (Metrology involves measurement, measurement devices, and procedures.) OIML guidelines encompass everything from how the weights are manufactured to how they are to be used in calibration procedures. What is a traceable certificate? Many weights and weight sets are available with traceable certificates as an additional option. These certificates are issued by laboratories and manufacturers that are accredited by NIST/NVLAP, ASTM, and/or OIML depending on the type of weight, manufacturer, and class. These certificates are traceable to NIST and contain information such as type of weight, weight class, density, uncertainty, and environmental conditions at the time of calibration. What is a certificate of calibration or calibration report? This report is similar to the traceable certificate however it will have a smaller uncertainty and more precise values. This has to do with the methods involved as well as the number of times the tests are repeated. What is a traceable mass value report? This report is traceable to NIST and reports the actual weight values, tolerances, and uncertainties. However the ratios reported are not guaranteed and is not considered an accredited document. A certificate of accuracy is not accredited or traceable. This report is required to be completed to NIST standards and will have an NIST report number. This report will contain the weight or weight sets serial number, description, nominal value, class and tolerance. Do I need a certificate for my weight(s) or weight set(s)? This depends upon your needs and requirements. You need to check with your governing agency, quality control department, or product literature. Usually if dealing with ISO-9000 requirements you will need some form of an NIST traceable certificate. How often do I need to have my weight(s)/weight set(s) calibrated? There is no set industry standard, but it is recommended that it is done annually. What class weight/weight set do I need? Class 0, Class 1, E1, E2- These weights are the most sensitive and accurate. These require clean environments and special handling. These classes would be used to calibrate Class I/II balances, balances accurate as 0.001mg, and as a laboratory standard. These classes are considered to be of extra-fine accuracy. Class 2- This class is considered to have a fine accuracy and designed for Class II balances. This class would be recommended for balances that are as accurate as 1mg. Class 3- Recommended for analytical balances as accurate as .01g. Class 4- Recommended for semi-analytical balances accurate to 0.1g. These are ideal for balances in school laboratories and industrial settings. Class5, Class 6, and Class 7, Class F- These classes would be ideal for industrial and harsh environments. These are most often used for scales used in the home and production settings.